Clean Technology | Nova Scotia Business Inc.
Nova Scotia is a natural choice for conducting research projects in cleantech. "Nova Scotia's clean technology industry attracts considerable international attention, with its expertise in energy monitoring related technologies and access to natural resources." Tesla Motors, along with Dalhousie University’s Canada Research Chair, Dr. Jeff Dahn, has an exclusive partnership developing lithium-ion (Li-ion) batteries. This is the first partnership of its kind between Tesla and a Canadian University. We have an understanding of a variety of different waste streams. From >seafood co-products to hot processed water, to agricultural biomass and woody biomass perfect for wood pellet production, Nova Scotia is the place to be for value-added BioProducts. The Bay of Fundy pushes more than 160 billion tonnes of water every tide — more than all the freshwater rivers and streams in the world combined. Canada’s leading research centre for in-stream tidal energy is located in Nova Scotia: the Fundy Ocean Research Centre for Energy (FORCE). 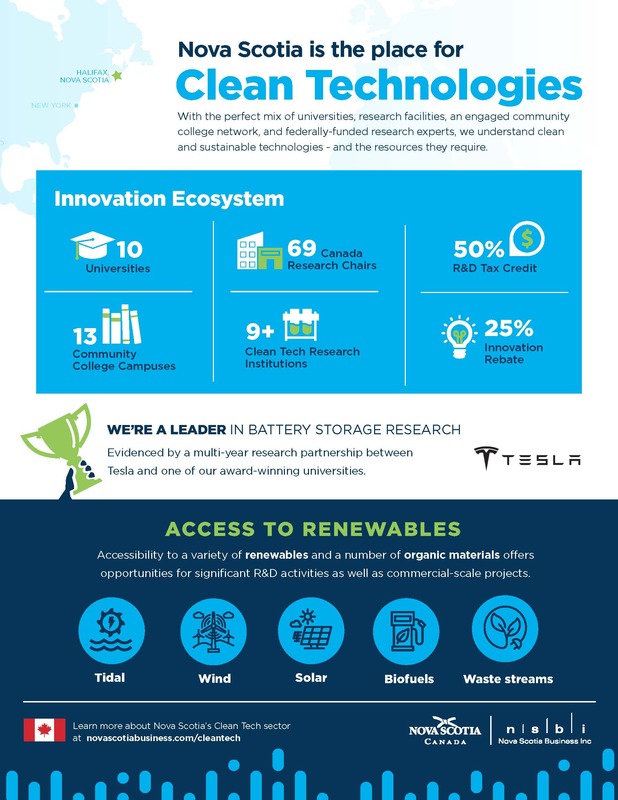 View our cleantech infographic for more details. A great location to use solar energy, Solar Nova Scotia has indicated the growth rate of solar PV installed capacity in Nova Scotia has averaged 80% per year for the past five years. Related to this growing solar base in the province, opportunities exist to develop technologies associated with monitoring, analysis, and prediction. With some of the highest average wind speeds in Canada, ranging up to speeds of + 9.51m/s, a wind turbine placed in Nova Scotia can produce large amounts of cost-effective power. View our cleantech infographic for more details. Canada’s University Capital, Nova Scotia, is home to 10 universities and 13 community college campuses. 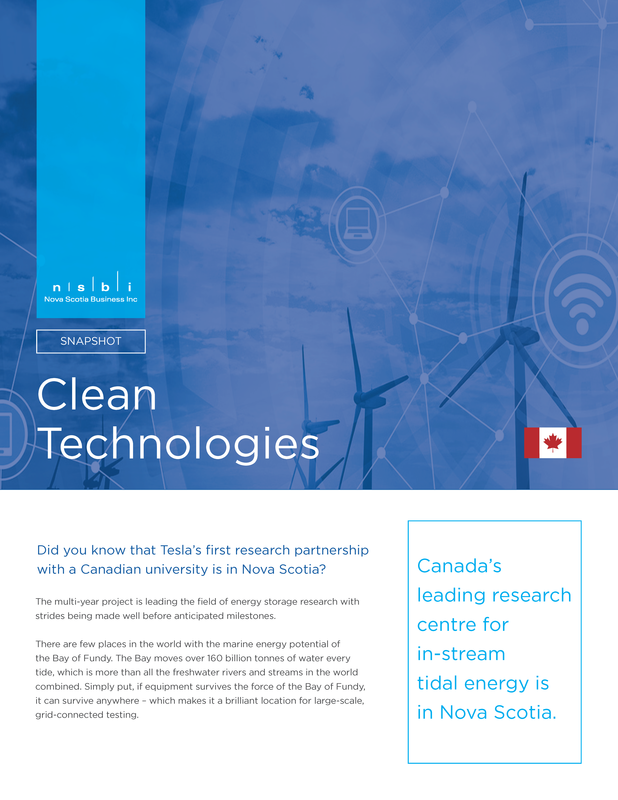 Nova Scotia has significant capacity in research and development within the clean technology industry. The capacity is built upon key relationships between academic and commercial partners focused on bringing new technologies and adapted existing technologies to market. The Fundy Ocean Research Centre for Energy (FORCE) is Canada’s leading research centre for in-stream tidal energy. FORCE offers grid-connected testing on the Bay of Fundy. There is the capacity to welcome a grid-connected project up to 5MW at FORCE. Centre for Ocean Ventures & Entrepreneurship (COVE) is a collaborative facility for applied innovation in the ocean sector where a community of ocean enterprises can start, grow and prosper. This hub of activity is home to local and global ocean technology businesses, post-secondary institutions, researchers, and marine-based and service businesses that support the ocean sector. A Crown Corporation, Perennia is a not-for-profit corporation with the mission to help farmers, fishermen and food processors be prosperous and profitable. They offer expertise in research, marketing and product development for products from the food sector – using waste streams and raw ingredients. The Verschuren Centre is a commercially focused research, development and deployment service provider for the cleantech sector. The Centre develops and delivers sustainable technology solutions in energy, food and resources management to businesses, governments and communities. Its mission involves bridging engineering and scientific research into environmental, industrial and socioeconomic policy contexts that promote the adoption and effective application of innovation for large-scale positive impact. Dalhousie University is one of Canada's leading research institutions. With more than 50 research chairs, Dalhousie is the largest university in Atlantic Canada. The School of Resource and Environmental Studies has partnered with industry on major projects centered on biomass and waste stream utilization, as well as process and resource optimization. Dalhousie is home to the Clean Technologies Research Institute. NSCC Applied Research develops practical and innovative solutions for industry's real-world problems. With an expert research team and a network of faculty and students from some of their most challenging and cutting-edge programs, NSCC helps industry improve products, enhance processes, and grow business. The team is building a microgrid to develop and commercialize smart grid technologies. Innovators have included Nova Scotia as an integral part of their global value chain. Canada has accelerated capital cost allowances for clean energy equipment. Based in Lunenburg, Kathleen Quinlan, Founding Partner at Fiore Botanica will represent Eastern Canada as a Finalist in the 2018 RBC Canadian Women Entrepreneur Award, presented by Women of Influence. Nova Scotia benefits from the largest tides in the world, a wealth of minerals and resources, and researchers that are attracting global attention.